I am a mother blessed with two adorable kids and so thankful for having an adventurous husband just like me. An accountant, part-time novel writer, nature lover, traveler, key-chain collector, adventurer, Nancy Drew fan, a sleepy head and a photo enthusiast. 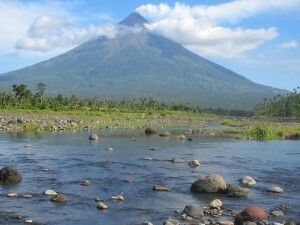 Albay is well-endowed with wonderful natural creations, from rivers, waterfalls, mountains, springs and the majestic Mayon Volcano. Our frequent summer vacation during our childhood days in our hometown taught me to love and appreciate nature. My heart was filled with unexplained emotions as the early morning rays of the sun were streaming to the vast expanse of rice-field in front of our house. What I knew then, good weather awaits an exciting escapade. As kids, we learned to swim in a natural spring by using empty gallons of 2 litters of cooking oil as our floaters. We braved trekking waterfalls, picked lovely wild orchids and crossed surging rivers. We even climbed a hill just to get calamansi and we slid in a steep rock stumbling down with dirt on our clothes and slight bruises in our legs. For us not to be punished by our parents in our little accident, we soaked our dirty bodies in a river and we will go home clean again. Our parents were so kind to allow us to go places. Just be sure, we will arrive home safe and unharmed, or else, we should ready our butts for our punishments. Those were just few of our exciting and unforgettable adventures with nature. And I can’t help not to smile as I ponder on this. The bountiful memory and the cordiality that bind me with my siblings, my cousins and friends are something priceless and something to treasure when I grow old. Such a delightful feeling bringing back the good old days. I was enslaved by my job as an accountant for quite some time, got bored with never ending analysis and computation. Until one day I found myself writing novel. First was rejected (ouch!) but the second was a hit! I came to realized that writing is my passion, my love, my life. From then on, my imagination kept on crawling and at the same time, I got fascinated reading travel blogs. And now, I am writing my own stories. I created Slippers and Shades as my personal blog to share our experiences, happiness, tips and ideas. I may not be that very good in blogging but I hope I can inspire you guys to get out from your shells and explore exciting places. Let a renewed feeling of optimism about life fill your heart. Admire how the hand of nature works, laugh and capture the moment. Thank you for appreciating my stories and the beautiful scenic spots in our country. Truly, we are blessed with lots of exciting places to explore. Ah, the joys of growing up in the countryside! You just made me remember so many happy days of my childhood. Reading about your adventures with your siblings made me miss those days, which I hold in my heart with so much fondness. Thank you for taking me back to those good old days, fellow blogger and wanderlust. Keep blogging and sharing more adventures! Truly, those unforgettable adventures made me more closer not only to mother nature but to my siblings and cousins as well. I guess, we’re of the same passion and had happy childhood memories. Cheers to that! Thank you very much for sharing your adventures in Davao City and Samal Island, Leng. My family has been to several scenic places including a few tourist spots in South Cotabato where we reside but we haven’t been to Hagimit Falls. I like to take my family there one of these days. It’s not just the falls i want to see. Among other things i want to see the hamigit trees. There are several hagimit trees near our farm. I want to see many more hehehe. These trees fascinate me. For aside from providing refreshing water to drink, they produce organic fertilizer for our trees and vegetables. Again, thank you very much for sharing with us your family adventures. God has blessed you with so much. He will continue to bless you more. I appreciated much your heart warming message Mr. Edwin and for the info about Hagimit Trees. Truly, Davao is such a wonder. I wish we could go back there in the future. I wanted to explore more exciting places including South Cotabato, Surigao, GenSan, Biliran and other parts of Visayas and Mindanao. Find time to explore South Cotabato, Leng. Thank you very much. Yes, South Cotabato is included in our wish list. Hope we could explore there too in the future. Hi! I wanted to ask you about your Camp tipolo Experience. May I please have your email address so I can directly communicate with you? You may directly inquire here na po and I would be glad to answer all your queries. Thanks for visiting my site.